Chelsea and Juventus reached an agreement for the Colombian winger Cuadrado to be permanently transferred for just under $25 million, Italian press reported Wednesday. 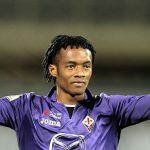 According to La Gazzetta dello Sport, Cuadrado will join the Italian Juventus for a discounted fee on a permanent deal when the January transfer window opens. The two clubs have entered in to a “verbal contract,” which will be made official once the transfer window opens up, according to La Gazzetta dello Sport. The Colombian joined the Turin giants temporarily over the summer following a miserable six-month spell in west London, reported the Daily Star British newspaper. He joined Juventus for an initial loan fee of almost $1.7million with the option to make the permanent move for around $28 million, which has now reportedly been discounted to ensure the transfer goes through in January. Cuadrado, who also plays for the Colombian national team is known for his direct style of play such as pace on and off the ball, as well as his dribbling skills. He made his senior international debut in 2010 and up until now has earned over 40 caps. He played for the Colombian squads which entered in to the quarter finals at two Copa America tournaments and the 2014 FIFA World Cup. Before transferring to international teams, the player began his career at Independiente Medellin, then moving to Italy in 2009. Chelsea signed him in February 2015, but has played “sparingly” this year, hence the loan to Juventus. The post Chelsea sells Colombia’s Juan Cuadrado to Juventus for $25 million appeared first on .